In case you haven’t noticed, your significant purchases are influenced by E-commerce. Reports say that up to 60% of total in-store sales are affected by E-commerce. Today, it has turned bigger than just buying something over the internet. It has become a series of interactions that depend on technology for moving goods. 2017 has been an excellent year for E-commerce. Its revenue touched $2.3 trillion with a target of $4.5 trillion by 2021. The online retail industry is continuously attempting to evolve their business by adopting technology trends. 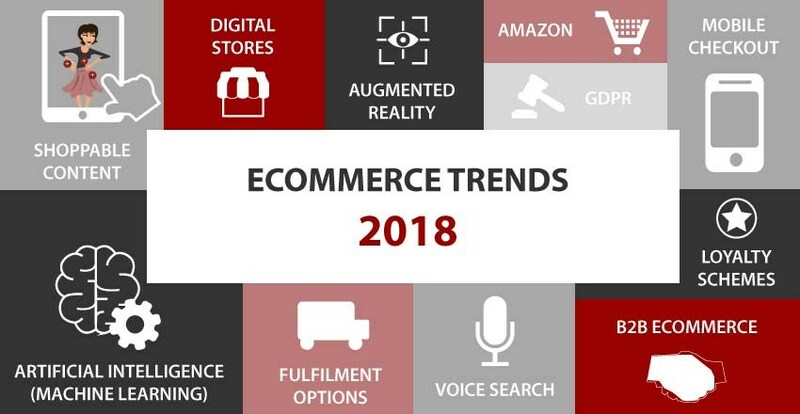 Here are a few top tech trends in the e-commerce industry in 2018 to keep an eye on. With the arrival of Virtual Reality and Augmented Reality, the consumer experience has changed a lot. With VR and AR, a consumer can now take a virtual tour of the digital store. They can now virtually try on new clothes and using the mobile camera, visualize how a piece of furniture will look in their home. With Augmented Reality, the shoppers get a more enhanced customer experience motivating them to buy. The Blockchain technologies are also influencing e-commerce to a great deal. The platforms based on these technologies appear as a segment e-commerce segment. The peer to peer applications like OpenBazaar offers transactions through cryptocurrencies. Each action on this platform creates a block that is the proof of work in the market. So, it is apparent that Blockchain technologies are slowly gaining entry in e-commerce and will soon be a method of payment for every digital shopping platform. Machine Learning, or ML, have made intelligent algorithms instrumental in the personalization and consumer segmentation. They are very helpful in identifying the browsing pattern of the consumers and creating personalized recommendations. Machine Learning helps in boosting sales by up to 15%. The management of order and inventory have become more efficient since they play a vital role in the inventory forecasting and predicting the demand in the market. The algorithms for anticipatory shipping can predict the shipping demand even before an order is made. This step benefits the shipping software. Gradually, people are getting used to the help of Artificial Intelligence and Machine Learning. This has changed the shape of e-commerce and will be a vital part of it soon. The rates of checkouts through mobile has risen meteorically. Mobile payments have significantly changed the way people shop. It has given them the freedom to shop on the go. Since 2015, the mobile payment market has grown steadily. Today, over ten different mobile payment platforms are available like Google Wallet, Amazon pay and of course, the renowned cryptocurrencies. Also, there are proprietary offerings from banks. We are moving away from cash payments, and it is inevitable that the mobile payment system will keep growing throughout the year and beyond. These days, you can’t talk about mobiles without talking about voice search. This year, the voice search will be a chief reason for the innovation in e-commerce. Devices like Amazon Echo and Google home are driving the voice search majorly. A study shows that almost 25% of consumers own a voice controlled device. Voice search isn’t just the novelty of the day but it is the next stage of consumer loyalty. There are numerous marketplaces and shopping carts. One brand sells across several channels. One product is available at different marketplaces at competitive prices. This multichannel availability of products has increased the demand for the software that can use API for communicating with various sales channel. ROPO is the abbreviation for Research Online Purchase Offline. This has been the shopping habit for some time now. It is usually adopted by the ones who are always looking for the best deal. This is going to be another tech trend in e-commerce this year. Every consumer like researching for products online before they buy it offline. This gives them their desired products at the best price. And for the retailers, it is the most effective offline conversion tracking. A study says over 80% of consumers search local stores for the product over mobile phones and approximately 20% among them buy it within 24 hours. Using this data, retailers can build the detailed profiles of the shoppers and benefit from them. The focus of the shoppers has shifted from the desktop to the mobile. Now, more users use their mobile for shopping. This has made any stores offer their apps, and they have been doing it for several years now. Shoppers are now very accustomed to using these storefront apps from these retailers on their mobile. 2018 will see even more storefront apps from smaller business as well. These stores will be leveraging these apps for driving up their sales and earning customer loyalty. Data shows that these storefront apps offer 40% higher conversion rates as compared to the mobile sites. Also, the average order value and session time is higher on the app. This indicates that apps will be becoming more prevalent. And since there is the lowest barrier to entry for the app development, it will be the added leverage. E-commerce is changing the face of shopping. Buying a product is more accessible and better now. Technology is driving the shopping experience of the shoppers at every stage. Machine Learning, Internet of Things, Virtual and Augmented Reality is shaping the entire E-commerce market. Consumers prefer apps, and mobile checkouts are at the peak. The technology in e-commerce allows the retailers to map the buying and searching habits of their consumers. This gives them a picture of what’s in demand and what has run out of the trend. The technology also let them anticipate the orders. Thus they never run out on the inventory. The shipping and delivery have become faster and efficient. Since its origin, e-commerce has come a long way, and it still has to go further. The tech trends of 2018 will be shaping this platform even more. So, if you are looking to stay in the competition, keep an eye on these trends. Every year e-commerce is increasing its range. The circle is getting bigger and better. E-commerce sites must follow PCI and DSS rules. This is not enough in a world of online breaching. E-commerce sites also require some extra security features to maintain their customers and minimize the threat. PCI DSS is a security service that looks into the data handling activities with card payments and online transactions. 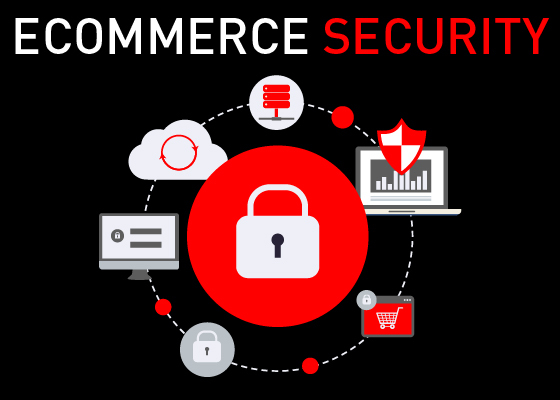 It is considered the base of cybersecurity, however, it does not consist of all the necessary security weapons needed by the e-commerce business website. The identity resource center surveys for about 1093 violations in 2016. 13.1% were revealed records of the credit and debit card information. Fraudulent activities, middleman, phishing are some of the security threats to e-commerce websites. The company has to bear a lot of breaching cost for this problem which cannot be ignored. There are several bot accounts of malicious content on the sites of e-commerce with huge traffic. Price scrapping- identification of the prices of the competitors in the market. So that you can improve your settings. Fraud login- Legal user credentials can be hacked, bots are used for detecting threats, give access to the third party allows them to steal information. SEO impact- If you try to cut the bots then there will be a possibility of imitating your contents. This is harmful as it will lower your rank. A lot of e-commerce sites hires the third party to store and host their data on payments and services. Otherwise, what happens when the third party utilizes your website? It poses a threat to your website. These increase the complexity and increase the danger of risks. Your e-commerce applications may fail. Your hosting service should cater to the following rules- ensure 256-bit encryption, have a proper backup, maintenance of logs, monitor tour network, demonstrate dedicated need to secure the site credentials through PCU and DSS. PCI basically checks the minimum requirement of your security. It helps to compromise only one issue. Patching your system is important, even on the same day any version is revealed. you must audit and test your systems on a regular basis. the major reason for which this breaching is possible is when hackers gain access to raw credit card details on the system. For this, there is a process called Tokenisation which deletes the need for storing customers card data. If you cannot get hold of the complicated e-commerce security systems, then you can ensure the use with a PCI compliance security technology. Cyber attacks the most frequent and constituted about 60 percent of the kind of attacks that takes place. Employees must be trained to understand the signals when they access the sites. For example- red flags which occur due to phishing attacks. For instance, if the employee cannot recognize them then they won’t check and record the vulnerability that is caused. This can inevitably harm the company site. After recruitment, make sure your employees are thoroughly trained in cybersecurity systems. In addition to this, a creation of a password, checking of flags, signals of attack, will do nothing but make your business a solid attack proof. If your site is not safe, the worst thing that happens is, you lose out on your valuable customers. As a company, you will definitely not like that. As a result, to get some relief from this, maintain SSL certificates. This actually helps the business to secure authentication and encryption of the precious consumer and customer data. It safeguards cardholder and the site from fraudulent attacks. What happens here is the certificate has some encryption protocols to make your payments safe as they enter the transit. If the cardholder data match with the card provider then that’s safe. It is this time when you know the customer is valid and it can also stop your data from reaching the cybercriminals. They can be prohibited from reaching our sites. There are a lot of times when people do not make regular transactions. Irregularities take place and there comes a time when financial issues come up. Check for these irregularities on a daily or monthly basis. On the other hand, there are customers whose IP address can change, whose shipping address and billing address change, keep a look at those. At times, anonymous email id registrations can make purchases. All of these reflect reg flag. Try to inspect the doubtful purchases and protect your e-commerce site with proper security. Finally, we can say that e-commerce is a process which enables easy, quick and automatic transactions and purchases. The more benefit it has, the more vulnerable it becomes with its methods. To combat the threat keep a continuous assessment of networks, e-commerce solutions. Over the period of time ensure secure data hosting, processing, and storage. For example, try to work with a security contractor to perform attacks. Accordingly, check your missed out vulnerabilities. Try to manage the patches on the website. Reduce the criminal or fraud activity by these methods. Furthermore, check famous and reputed e-commerce security services. Not to mention, cybersecurity is not a one day or one-time phenomenon. You have to keep on updating the systems and make sure you shield your organization from dangers. Beware and follow routine checks and inspections. If this article was helpful for you to please like it and share it with people and let them know about the ways how you can have a secured website for your business. E-commerce relates to all the transactions taking place over the internet. It is the activity of selling goods and services by using the internet. It uses technologies like mobile commerce, electronic fund transfer, online marketing, electronic data interchange and so on. It saves time and money because customers can buy their products by seating at their home. Transactions can take place 24×7 therefore, it is convenient for users. It is possible for businesses to reach a wider range of customers. A company can operate its business without a physical set up. A recent study shows that more than 50% of the shoppers prefer to buy products from the overseas retailer. Big Commerce sellers can handle operate their business in more than 150 countries. Hence, it is easy to accept payments through PayPal and Stripe without transaction fees. It is now easier to sell products to the global market by using shipping calculators and integration. Sellers can afford shipping fees and taxes without reducing their profit margin. It is a software to help you to list products for sale to third-party markets like Amazon and Walmarts. Besides, it helps sellers to avoid overselling of a product. By using Channel ape it is easier to synchronize and automate all business activities so that the productivity of business is improved. Channel ape enhances customer support coming via email, phone, and live chat. Utilization of this software does not deduct charges from your revenue. Instead, when the merchant pulls inventory and passes them to his sales channel, a deduction from his business takes place. Channel ape supply you information on inventory, customers, shipping, suppliers, sales channel, etc. With Channel Ape, retailers can pull goods from suppliers and push them to third-party marketplaces such as Walmart sand Shopify. If a retailer uses 50 supply channels then Channel ape will help him by centralizing these channels into a single data point. Personalization allows marketers to gather data on consumer’s browsing history, buying habit, and every minute detail to facilitate their decision-making process. Personalization is a two-way matter in the sense that now it is also a consumer’s expectation. It is easy when sellers have access to correct information. Everage allows the seller to interact with each customer that visits their site or uses their app. Therefore, customers can gain a personalized experience. Using Everage sellers can track the shopping behavior of every visitor’s shopping behavior on their site and mobile app. Sellers can offer a highly effective personalized product and content recommendations on the basis of individual preferences. Everage is converting more shoppers into buyers and increase average order values. Approximately half of the social media users prefer messenger app to connect with brands, in spite of an email, phone or live chat. Chatbot can reach customers and can respond to their requests at the perfect time. It collects more data on customers and their responses. It can engage with shoppers in the absence of a native app with them. Chatbots can also integrate with Facebook Messenger, Kik, and Skype. A chatbot is a computer program therefore, it cannot empathize with the visitors. So a human as a representative of customer service is required to be present for this purpose. Here comes the creation of Pandarobots. to build smart chatbots for e-commerce. It can build a virtual agent according to the Seller’s specification. It allows the seller to add an avatar and speech capabilities to complement chatbot. Customers suffer from insecurity and do not use e-commerce. Retailers also lose billions of dollars every year as a result of fraudulent activities. therefore, merchants are emphasizing the security factor of customers. 58.5% of the merchants consider their address verification service, card verification number, and device fingerprinting as effective tools for verification. On the other side, only 25% of merchants consider negative lists and two-factor phone authentication as the most effective tools. 62% of merchants think chargeback is the best fraud prevention tool. Manual review is also efficient in avoiding fraud but it is the most expensive tool. 79% of businesses use manual review. With the help of Chargeback, merchants can bring all of their data sources together and thereby, they can spot fraud before it occurs. Even if they fail to spot fraudulent activities, they can control the damage created by these activities. This, in turn, helps to refund customers, prevent order fulfillment and reroute shipment. These hot trends will encourage more merchants to promote their products to a global market. It will bring a new horizon in the e-commerce industry. Increase in customer base and revenue will also be an advantage for merchants. Integration with third-party marketplaces will build brand awareness among customers easily. Customers will have a personalized shopping experience. Last but not the least, it will be easy to prevent fraudulent activities. Click on an order button and get goods all the way from overseas at your doorstep, this is what E-Commerce do. Today, people are accepting E-Commerce and are adapting to online marketing. Have you ever ordered anything online? Have a look around the room, Can you find some? You can easily find a few things in your room which you have bought from online. The customer wants cozy shopping atmosphere and service provider wants the global market. E-Commerce works for both. It allows the consumer to purchase goods electronically and it provides the retailer with a platform of a global market. The E-Commerce market is growing rapidly from the last few years. People who are involved with this knows that it is constantly changing and upgrading. Companies are battling with each other to survive in the market. 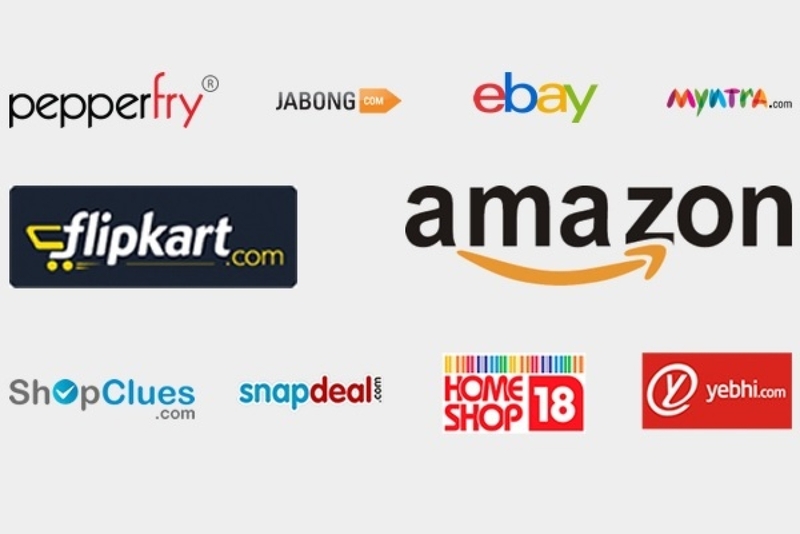 There are many E-Commerce sites like Amazon, Flipkart, Snapdeal, Myntra, Jabong etc which tug at our heart. If online identity verification is absent-A considerable revenue loss happens in the absence of Online Verification. Sometimes customers are making COD purchase with a fake or invalid phone number or address. In order to avoid this situation COD automated call should be present to ensure if the customer is genuine. Know your competitor-In this competitive world knowing about your competitors are essential. You have to show people why and how you are best and extraordinary. Customer loyalty is essential- Holding on to a customer is essential, but if you fail to build customer’s trust then you will surely struggle with your business. The necessity of return and refundable policy- To avoid a massive loss in revenue when a product is returned, you need to have a strong return policy. This basically happens either due to the customer’s dissatisfaction or due to the damage. 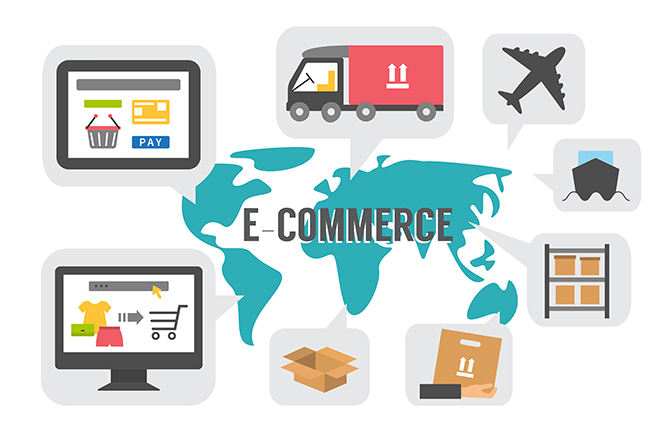 Reasonable price- Sometimes consumer go through 2 to 3 E-Commerce sites before they finalize their purchase; therefore, it is necessary to provide them with reasonable price. Intense competition between retailer and manufacturer- Many retailer and manufacturer sell their product not only at online marketplace but also directly to the consumer on their websites. Data Security- Failed in security means fraudster posting lots of spam. They can attack the host server and infect all the websites with viruses giving you a nightmare. You have to look into your data security to survive in the market. The web can be sloppy but your online shop certainly cannot afford to be! It needs an excellent strategy to survive in the market. Surviving in the market is tough and needs lots of planning. You have to continuously fight to top the chart and become one of the top E-commerce sites. In order to gain profit, your business needs to be global. This is only possible through online marketing. 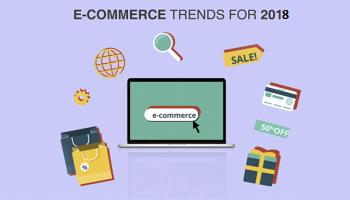 The new year is upon us and the online store owners have already begun to look at the future of Ecommerce trends 2018. It is important the business does not stand still in this competitive market. Here we take a close look at the 5 E-commerce predictions for the year 2018. Often, the major problem with online shopping is the unsatisfactory shopping experience after purchasing something online. This happens mostly due to the minimal pictures of the products that are available for the customer to see. It is of no surprise that a lot of times the products which are purchased online are returned by the customers. As because once they open the package, the customer does not find the goods as good as the pictures present in the site page. It is a frustrating phase for the customer and in contrast a costly for a retailer. For many years, the online stores have tried their best to modify their shopping methods by providing the best shopping experience to the customers. Methods such as offering image galleries, videos, customer reviews, etc have been found useful by the customers. However, now the retailer shops are beginning to use augmented reality to provide the customers with a much better understanding of how their products will look like. There has been a lot of talk about the shift towards mobile shopping over the years. It is predicted that there will be a massive increase in mobile sales in 2018. It is expected that the mobile phone sales will account for about 50% of all the e-commerce revenue. There are many reasons behind the shift toward mobile shopping. The mobile technology continues to grow, with better smartphones and networks available to the customers. These factors make it easier for the customer to shop. For a lot of people, it is easier to use mobile at home than using Laptop. With the increased development in phone technology, we are now seeing an additional effort from the online businesses to provide a better mobile experience to their customers. Various companies are now creating such websites and apps which makes searching for products lot simpler. Due to this new welcome change, the trend of switching to a computer for making an online purchase has stopped. Last but not the least, an improvised payment method has made mobile an even more attractive device. This has strengthened the faith of customers into mobile payment. Packaging is very underrated when it comes to the sale of a product via online purchase. Undeniably, it has a number of effect on the e-commerce customers. Packaging protects the product at the time when it is shipped to the customers. For an instance, there are over 40% of the customers’ worldwide who receive damaged products due to the poor packaging. And thus the customers are hesitant to purchase anything from that online store again. The process of packaging has a consequence on the brand as well. The brands who sell the top-end goods need to ensure that the product appearance matches the high demands that are set by the customers. Another key factor to keep in mind is if the packaging that is done, is eco-friendly or not? Whether or not the materials used are recyclable? Is the package provided with sufficient amount of protecting materials such as bubble and tissue paper? This is because many customers worried about the wastage that takes place with the e-commerce shipping. Providing your customers with a proper packaging will result in an increase in the number of sales and attracting new customers towards the brand. With the continuous growth of online shopping, the marketing businesses are understanding the importance of a personalized shopping experience. By providing a better search and customization features to the customers, retailers make a lot more money. Satisfaction of the customer instantly leads to the increase in sales. Indeed the sites who offer newly personalizing techniques see the usual rise of 5-10% in sales. The online retailer stores try to provide a customer-centric shopping experience to the customers. A better user interface in sites and apps increases the number of customers. Basically, by employing the data analysis and computerizing, they provide accurate suggestions based on the customer’s wish lists, recent searches as well as the purchase history. Personalizing improves the shopping experience of the customer, thus resulting in an increase in sales. Such technologies are usually offered to the customers with the use of extensions and the plugins. There is a big emphasis on Shipping in E-commerce. This is one of the major reasons why one customer picks one retailer over the other. With Amazon and eBay upping their shipping game, the customers have now set a much higher bar with regards to expectations of their shipping. E-commerce sites have expectations from the customers to provide similar high-quality shipping services. Basically, when it comes to shipping, the customers want their products to be delivered quickly with no delivery charges as well as in a place of their convenience and time. Hence, the E-commerce companies will need to provide a range of options to the customers for the shipping of their products. For an example, the companies can offer a free delivery within two days time or possibly charge an amount for the delivery to happen next day. In the year 2018, shipping options will continue to evolve. The more delivery options the E-commerce retailers provide, the better they will be able to meet the demands of the customers. 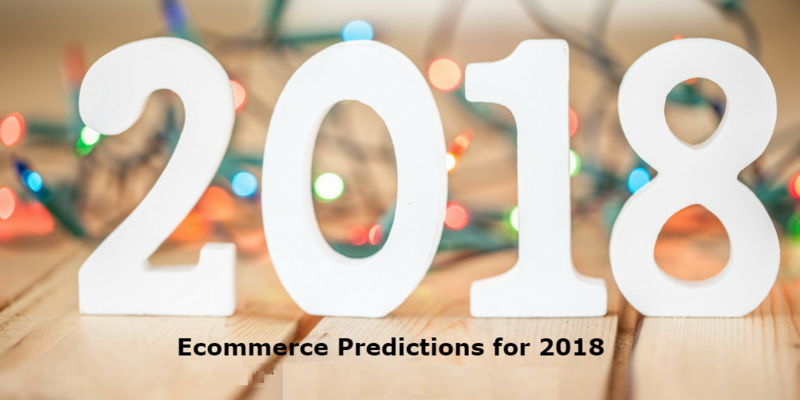 There are many interesting E-commerce predictions for 2018 as you can see. From the enhancement of the shopping sites to the increasing importance of mobile phones and how it impacts the sales in a positive manner. E-commerce is an on-going trend and it will continue to evolve and improve with time. The ultimate aim is to make things simpler and easier for the people. Such as the delivering of the products in a quick, easy and convenient manner. E-commerce continues to promise an impact and it will continue to make an impact with more and more new technologies to arrive in the near future.